Welcome at Savannah-Cat.de! Since April 2003 our new website is online - offering tons of informations and pictures about our savannah cattery, about the history, character, look and standard of the large spotted Savannahs. Unfortunately most of the information is currently only available in german language. But we are working on the english translation and we hope to put it online soon within the next few weeks. 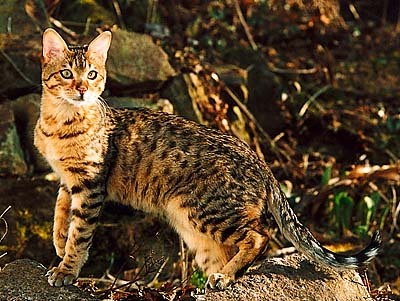 If you have any questions about savannah cats or if you are interested in our kittens and our breeding plans, feel free to contact us by email. News: F1, F3 and F5 kittens available! All rights reserved. No material from this site may be copied, reproduced or distributed!